This typical Canary house of two storeys (approx. 55 m2), has been completely rebuilt in 2018, respecting the Canary architecture. 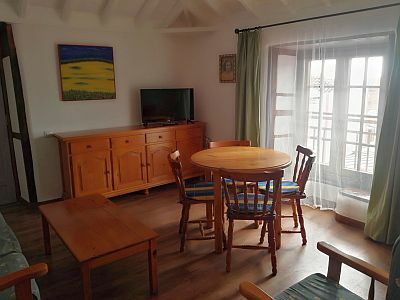 On the first floor there is a combined dining and sitting room with seaview, flat screen satellite TV with radio, free Wi-Fi and rental safe, the master bedroom with double bed, the bathroom with bathtub and the fully equipped kitchen with microwave. From the furnished roof terrace you have a panoramic view over Santa Cruz, the mountains and the sea. On the ground floor there is an extra bedroom with double bed. In the entrance patio in front of the house you find a washing maschine for shared use.